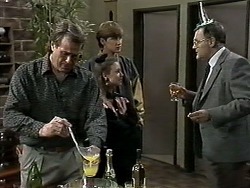 Harold is moved by Gemma's tears and says he'll have a word with Madge, but Gemma has to obey Madge's rules in the meantime. He tells Gemma she'll just have to practice self-control and not see Matt. Gemma wails that she can't stand not seeing Matt, but agrees. Madge sees Felicity on the street. Felicity tells her there's an extraordinary meeting of the council on Monday night - they want to stamp out corruption. 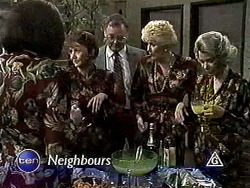 Madge is a bit takenaback, but just then Pam comes over and invites Madge to her party tonight. She invites Felicity too. Madge rolls her eyes. The room is decorated in streamers etc and Dorothy and Ryan are the first to arrive. Dorothy is wearing a new dress that she bought from Eddie. Doug pours Dorothy a glass of vile-looking yellow punch. They chat about the school curriculum and how it has changed. 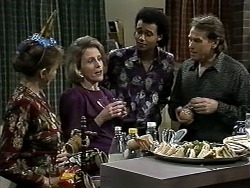 Dorothy tells Doug that one of their teachers has uncovered a group of computer cheats, but she doesn't say who. All the ladies decide to stay in the same dress anyway. Gemma and Ryan are lurking in the kitchen by the food. She asks Ryan to take a note to Matt for her. 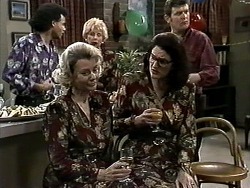 Eddie comes in and looks shocked at them all wearing the same dress. Ryan has brought Gemma's note to Matt. Matt says he's going to stand up to Madge, but Ryan says Gemma is set on giving Harold's way a go. Ryan comes back and he and Gemma decide to go back to the Bishop house watch some television. Madge is still arguing with Eddie, wanting a refund for her dress. 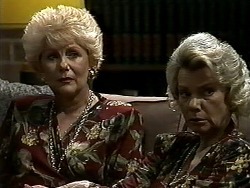 Dorothy and Helen are chatting about beverly - there's still no news. Felicity arrives and looks quite out of place in a different dress to the rest(!) 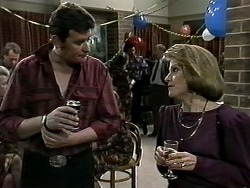 Madge sends Harold home to check on Gemma and Ryan. FELICITY: Are you all in the same club or something? Why are you all wearing the same dress. FELICITY: I'd say you're all wearing stolen goods! Ryan and Gemma have made popcorn. There's a knock at the back door and it's Matt. Gemma tells him to leave immediately. Just then Harold arrives, so Matt goes out of the back door. Des is being bored senseless by Felicity. Then Felicity tells Doug that she needs a builder to do some renovations to her house. Madge, Dorothy and Helen are glowering about Felicity. Dorothy and Helen start talking about being single in a couple's world. Suddenly the door opens and everyone looks up in shock - it's Beverly! 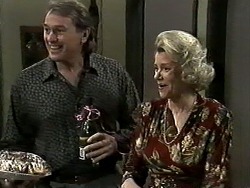 After the initial shock has worn off, Helen takes Beverly off to one side. HELEN:(crossly) Just what is going on? BEVERLY: What do you mean? I'm back. HELEN: Just like that? As simple as that? Have you any idea what we've been going through? Jim especially. He's been looking everywhere for you! Today he had to go to the morgue to identify a body they thought might have been you! Beverly is shocked - she says she just needs some time to think. 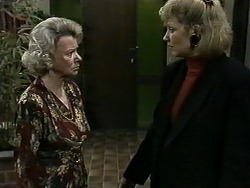 Helen rages that a note is not enough - she shouts at Beverly to go and find her husband and tell him that she's alright. Gemma and Ryan are watching the film and Gemma is moaning about Madge not trusting her. Ryan says maybe it's not worth breaking the ban - Madge might send Gemma back to Brisbane. Gemma says nothing will stop her and Matt being together. Beverly is sitting in silence when Jim comes in. He is chuffed to see her and gives her a hug. He tells her he's been worried sick. 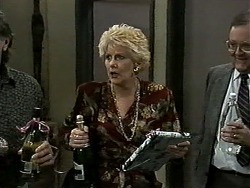 Beverly tells him that she needed some breathing space and Jim starts to get angry. She apologises for worrying him. BEVERLY: I'm sorry, I didn't mean you to get upset. JIM: Upset? Where were you?!?! 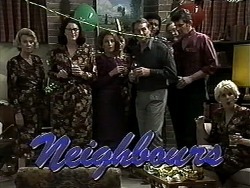 Beverly tells him she was staying with a friend and Jim asks if she was really staying with Ewan. 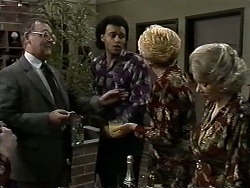 Beverly accuses him of being drunk. Jim tells her what he's been going through - he's as mad as hell. Beverly runs off to bed saying they'll talk about it in the morning. Matt has turned up to have a word with Harold. Harold says there's nothing he can do about the Gemma situation - Matt will just have to be patient. Felicity, Madge and Helen are talking about corruption on the council. Felicity is banging on about "Power Corrupts". Dorothy sticks her beak in and thinks they are talking about Madge quashing the parking ticket and gives the game away. 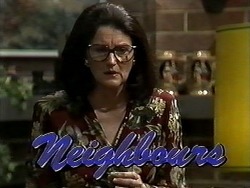 Felicity says that Madge's days on council may be numbered!